Great pastors are hard to come by. Once you find one, you don’t want to let him go. A great pastor should be shown gratitude and honored for the service he provides. Consider showing your pastor appreciation with a poem. 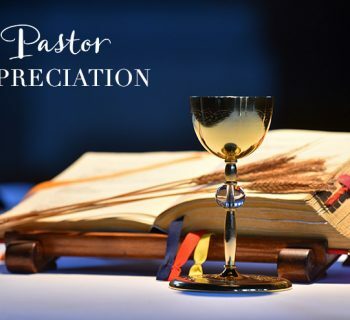 Choose from one of our sample pastor appreciation poems or write your own poem for your pastor, priest, preacher, reverend, minister, or clergyman. To write your own poem, begin by choosing a title, and move forward from there. 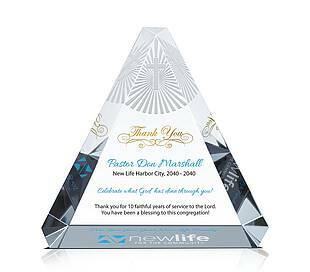 Have the title, poem and sentiments engraved onto a shimmering crystal plaque for a beautifully timeless gift for your pastor to display and keep. 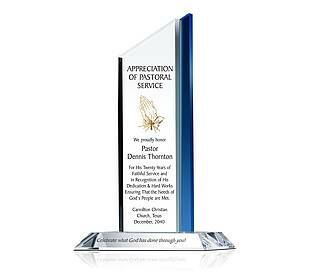 When combining the beauty of a crystal pastor appreciation award/plaque with your special appreciation message, you create a personalized Pastor Appreciation Day gift that will be treasured by the recipient long after a Pastor Appreciation ceremony. For more on crystal plaques check out DiyAwards.com. 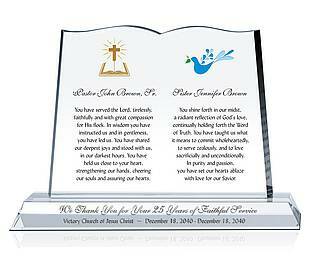 They offer free engraving of your chosen poem and all personalized messages on any of their crystal awards. What do you think a pastor is? Have you ever wondered about this? This poem, written in a pastor's voice, explains what a pastor truly is in the eyes of God. People wonder "Who is he?" Where did he get his degree? Does he have a P.H.D.? My friend, pastor Steve showed me a personalized crystal book with this engraved poem - Thanks, Pastor. I think this is the perfect tribute for priests. The plaque has praying hands on the left symbolizing the pastor's devotion and commitment to the people he shepherds. There is ample space to express your personal appreciation on the right side of the gift plaque, such as engraved this appreciation poem. Thank you pastor poems are a good way to show that you care and to show appreciation for all that they do. Encouraging each to fulfill their ministry. This pastor poem is cleverly constructed to describe a pastor, the word "pastor" is used as an acronym to describe his heart. A man I appreciate and love, and who I am proud to call "My Pastor"! These two original poems, were written by a pastor for pastors. They are a reminder that we all need help and we're all human, including the best of pastors. Pastors pray with us about our needs. Pastors counsel us through our life's challenges and fears. Pastors consistently deliver sermons to uplift our souls. Pastors visit us when we are in the hospital. Why do they do so? Because they seek to point us towards God, because they walk with God. Pastor, there's too much to do. Grew up to walk a lot. Dear Pastor, walk with God! 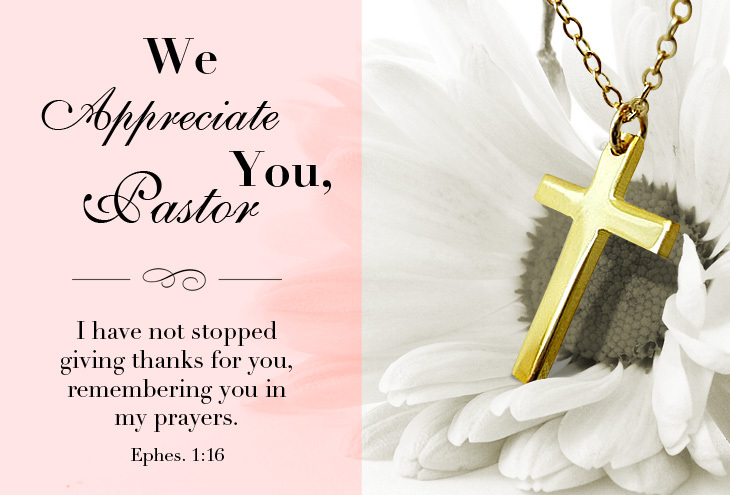 How should we express our appreciation and love to our pastor? What's the best time to appreciate him? Don't just wait to celebrate Pastor Appreciation Day, Father's Day, Thanksgiving, and Christmas. Celebrations should also be held for a pastor's birthday, anniversaries and retirement. 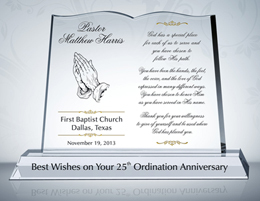 These are all special days for our selfless pastors. I pray your faith is firm, unbending. 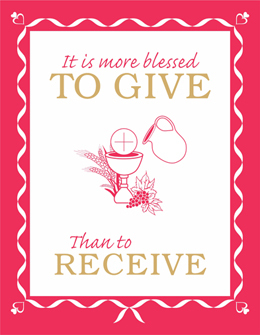 Receive His blessings without ending. I pray your hope is always strong. Receive His comfort all year long. I pray your love is ever growing. So our souls for Him keep glowing. I thank you that you've done your part. You bring His sunshine to my heart. And all your loved ones too.